My grandmother was an amazing lady. The oldest of 10 siblings, she was more like a mother to the younger ones, even though she had her own child when her youngest two brothers were born. She was always active with her family, her church and her friends and she never let anyone tell her she couldn’t do what she wanted to do. She traveled a lot, she’d been to Hawaii with the senior center, she told me stories about the road trips out west that she took with her sisters, I think she might have visited every US State except Alaska. 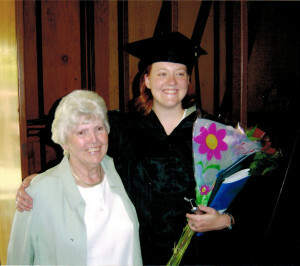 Mamaw and me at my college graduation. Family was so important to her. 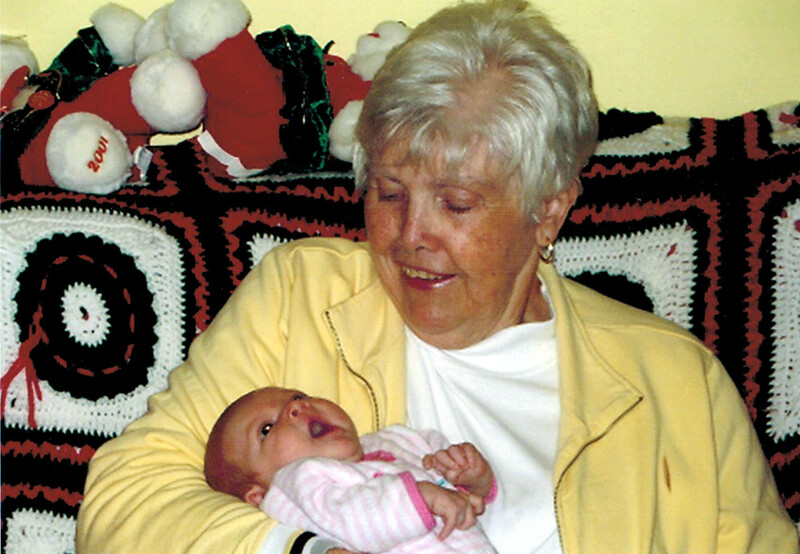 She was our matriarch and genealogical researcher. 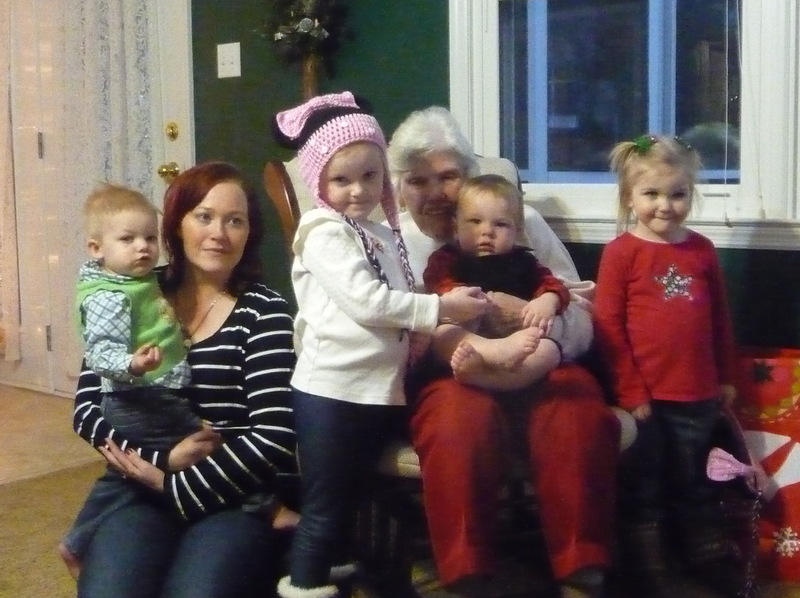 She adored all of her grandchildren and was able to be a part of her four great-grandchildren’s lives. 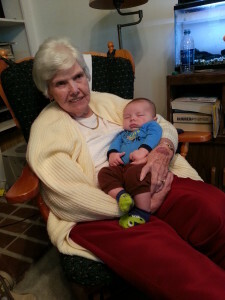 With her first Great-Granddaughter, Ella. She was kind, loving and thoughtful to everyone around her. She was smart, funny and crafty. She did quilting, cross stitch, knitting, crocheting, and scrapbooking. She was in charge of printing the church bulletin for Sunday service. She remembered everyone’s birthdays (which is something I can’t even do with the aid of a calendar app!) She enjoyed good clean jokes and would give you THAT LOOK when you said something inappropriate. 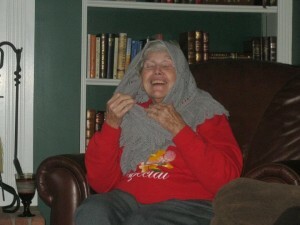 Enjoying the shawl I made her for her 80th birthday. 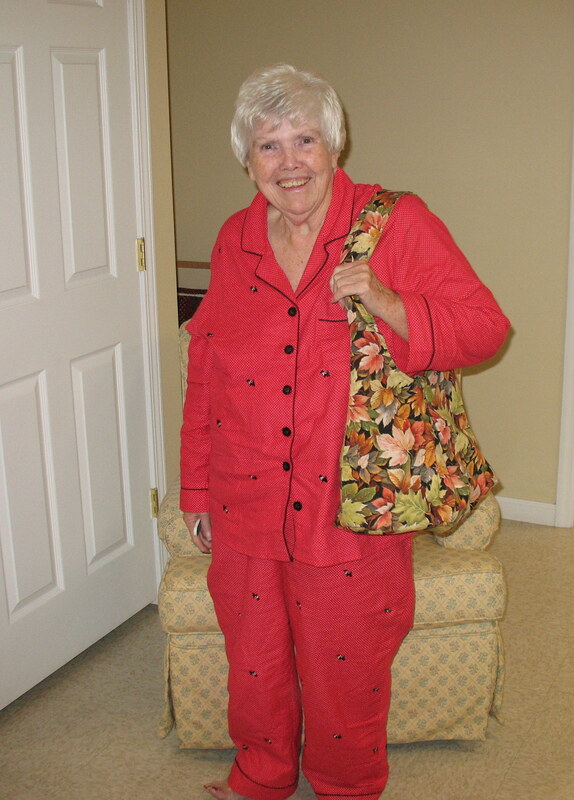 I used to do a lot of quilting and I took her with me to a quilting retreat one year. We both had such a great time, and it’s one of my favorite memories. At the quilt retreat, sporting a brand new purse I had just made for her. She was as much a part of my growing up as my parents. She went to band concerts, school plays, awards ceremonies, and graduations. She even went to marching band competitions and sat in the rain to watch us play. Trash bags are really great rain bonnets! Last year, we found out she had cancer. It turned out to be an aggressive form of melanoma. Her doctors sent her to Vanderbilt’s cancer specialists, which I happen to live close to. The trips were long and very hard on her, but I’m grateful she was able to make them and that Jellybean and and I were able to see her so often. 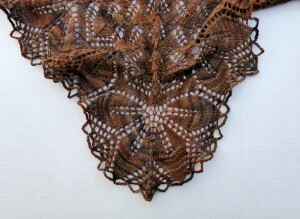 Shortly after the first trip, I started the Haruni Shawl. I needed something to work on that would let me get lost in thought as I knitted. 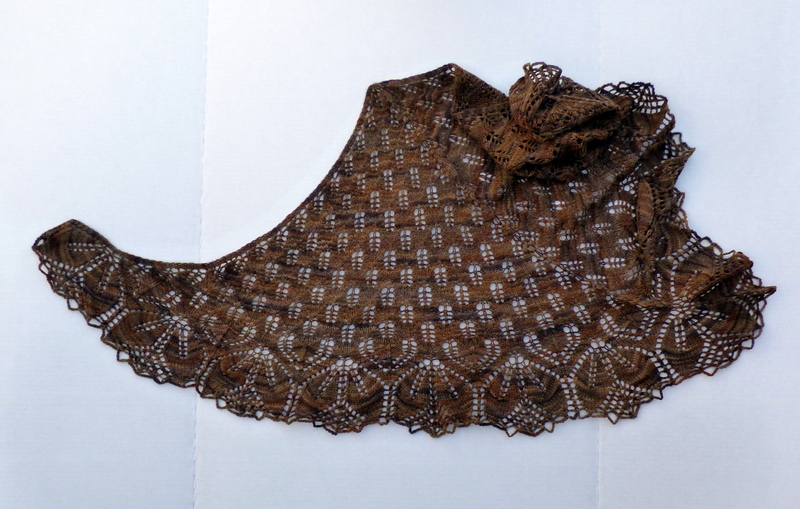 This pattern had been in my Ravelry queue for a long time, so I finally got the yarn for it. I cast on and got to work, and it wasn’t until much later that I read the description. It took about 6 weeks to make it and during this time, my grandmother was back and forth to Nashville several times seeing doctors and specialists, preparing for surgery and then not having it, and finally making the decision to receive palliative radiation therapy and hospice care at home. The whole time feels like a blur. We were fortunate that we were able to go visit her twice before she passed away. Before our last visit, I knew it would be the last time I would ever see her. I knew that I was fortunate to have the chance to tell her anything I needed to say. I told her that I was so glad we had the chance to have an adult relationship and that I loved her very much. I will, Mamaw. Don’t you worry about that. What a wonderful testimony to your grandmother. She was so proud of you. 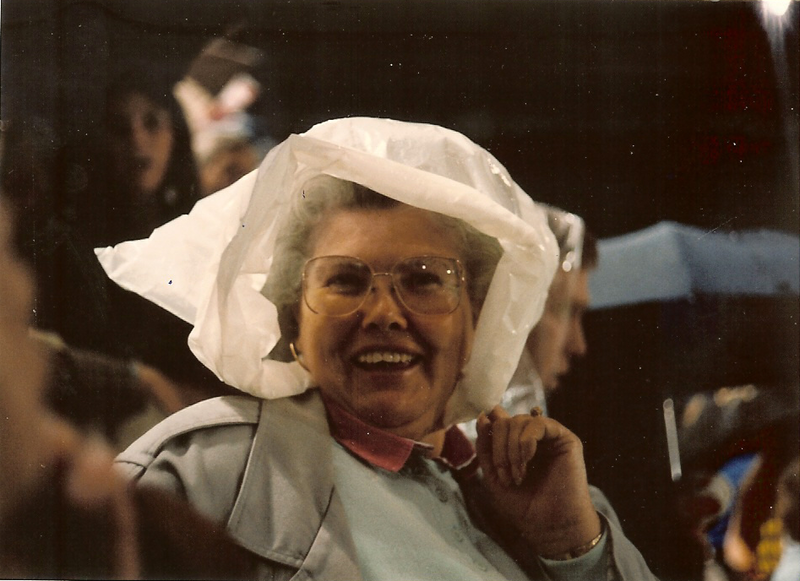 She was always in your corner and she loved being with you guys. The band competitions was a delight when she was there. I will forever miss her and there’s a big empty space in my heart for her. These words are beautiful and could only be written by you. 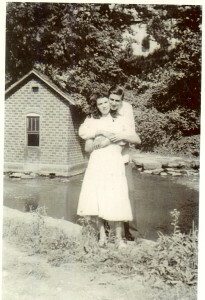 I love you, sweetie, and Mamaw did, also. I know she’s watching over us. Oh Abby, that is the most beautiful tribute to Margaret, she was a great woman and will never be forgotten. 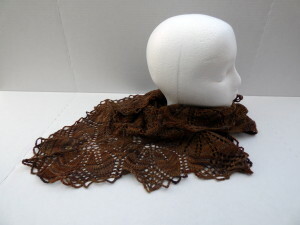 The shawl is the best lasting tribute you did. What a lovely, lovely tribute to your grandmother. She was obviously a very special lady, who has impacted your life in many ways and makes you the special woman you are. I love your special memories of her. Thank you all for your kind comments. This post was very hard to write. I started it in September! 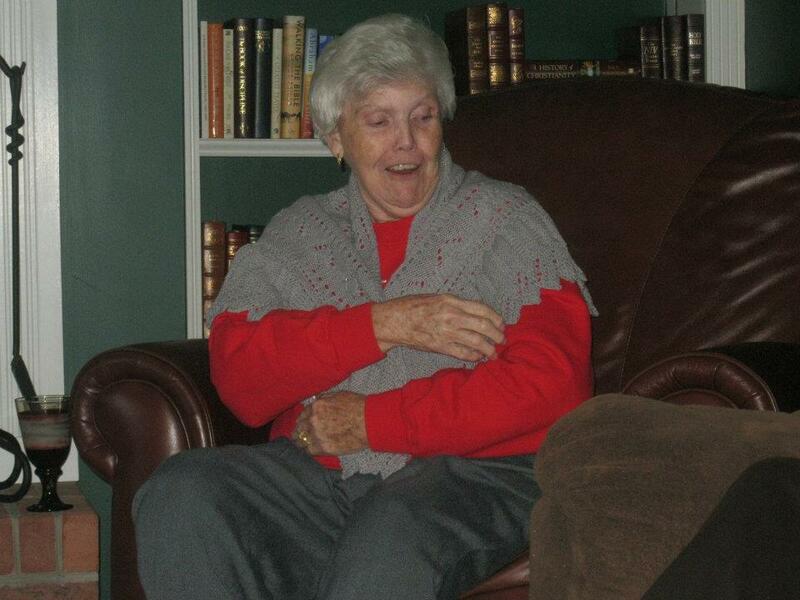 She has definitely been a great influence for me and I miss her very much.